Philippines, Manila - The Palace released official announcement regarding to the 'No Classes, No Work' all throughout the country on Friday, September 25, 2015. President Benigno S. Aquino III set the said date as a regular holiday in observance of EID’L ADHA (Feast of Sacrifice). 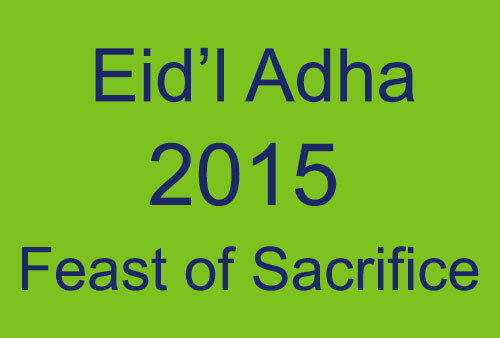 Eid'l Adha is popularly known as Feast of Sacrifice and this is celebrated around the world by all Muslims. The National Commission on Muslim Filipinos recommends that the observance of Eid’l Adha in the Philippines be on 25 September 2015 based on the Islamic Calendar and the declaration made by Saudi Arabia’s highest religious authority, according to Proclamation No. 1128, s. 2015. The occasion was earlier recommended to observe on 24 September 2015 but amended to the above said date. Eid’l Adha is one of the two greatest feasts of Islam. And under Republic Act No. 9849 provides that Eid’l Adha shall be celebrated as a regular holiday. For more information about the Eid'l Adha, please kindly bookmark this page and share to your joined social networking sites. Comments or suggestions about "No Classes, No Work on Friday, September 25, 2015 - Eid'l Adha" is important to us, you may share it by using the comment box below.